Steam rug cleaner reviews found on this page are for the best area rug steamers. It is important to note here that in reality steam cleaners do not do deep cleaning of carpets or rugs. To deep clean your carpets or rugs you will need carpet steam cleaners some of which we review here on this page. Steam cleaners which are essentially steam floor cleaners or hard surface cleaners such as hardwood steam cleaners are used to sanitize area rugs. Steam cleaning your area rugs will help in loosening tough dirt for easy pick up with a vacuum cleaner. Steaming will also get rid of any immediate stains that may occur through various accidents around the home. When considering steam floor cleaners for your area rug, you will need one that has a glide attachment. This will enable the steamer to run over your rugs. Hotter steamers will do a more effective job than lukewarm ones. When the steamer rug cleaner is very hot it takes less time for the rug to dry up as it won't be that much wet. At 1200 watts this steamer is amongst very hot steamers. It is in fact considered a dry vapor steam cleaner due to its high temperature steam with low moisture content. This is essential and ideal when steaming carpets and rugs because it takes little time to dry up due to vapor. It is also very effective in removing stains and stick-on stains that is normally found on rugs. When steaming your area rug using this steamer, you will need to attach a gliding try. This makes it possible for the steamer to run over your rugs or carpets without getting stuck. The steamer is so hot at 212 degrees it is considered able to kill bacteria and also kill bed bugs and dust mites. This Haan SI-35 steamer heats up quickly and produces steam lasting some 20 minutes. 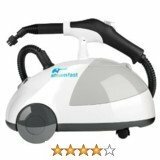 It is a highly rated steamer with tons of positive reviews for different users who have varying degrees of experience with hard floor steamers. One of the things it is favored for is its ability to clean without detergents. It is also very light, easy to store and removes odors and bad smells from your rugs and carpets. We fully recommend this steamer for your rug steaming. It has on average 4.5 stars out of 5 which is an outstanding rating for any household appliance. In terms of price it is on the higher side not costing anything less than $100.00 when purchased brand new. If you are interested in Haan steam cleaners, follow link for detailed reviews and ratings of other models. 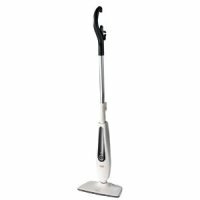 The Euro-Pro S3501N is a steam mop for hard sealed surfaces. 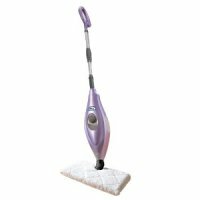 It is also an effective rug steamer using the accompanying gliding attachment. Not only will this steamer be useful for the, refreshing, deodorizing and sanitizing of your rugs, it will also effectively do you wood, tile, linoleum and vinyl floors. It relies on no chemicals but tap water which however mustn't be hard water in order to protect the steamer from damage. If how well this steam rug cleaner has performed with other users is your concern, it has very good ratings from hundreds of users and owners. This steamer has a very long cord at 30 feet which should allow you to reach far in any room and possibly steam the entire rug without having to change plugs. The adjustable handle of this steamer is really appreciated by users and did not exist in the earlier version of the steam mop. It helps with your back comfort. We give thumbs up to this steamer for your rug. It sells for about $100.00 and will be able to do more around your home than just steaming your rugs. You may consider of other Shark steam cleaners in general by following link. Below are some important deep cleaners to consider for your rugs. These will do what the steam cleaners cannot do, which is to deep clean. Once in a while, at least once a year it is the recommended to do deep clean of your rugs. The cleaners below even though called steam cleaners are not in reality steam cleaners as they only use hot water and produce no steam. 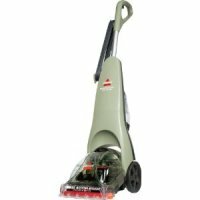 This Bissell Quicksteamer 17701 is specifically designed to deep clean your carpets and area rugs. It is a light weight appliance which the manufacturer wanted users to easily carry around the home. Also because it is light and easy to use, many home owners find it useful in dealing with small spills and accidents. This unit is highly rated and sells for under $80.00 on Amazon, for example. It completely removes any odors and dirt from your area rugs as well as carpet. The steamer has two tanks that takes water and a solution for your rugs. The tanks are generally smaller on this model and will mean repeated refill if your are working on a large area of rugs. It has been praised for its ability to clean to near perfection even high traffic areas on a rug. It also comes with a hard floor attachment which will make it possible for you to clean your tiles, wood floors and so on. However, some people have not been impressed by the hard floor attachment as it does not clean tiles effectively. We highly recommend this deep rug and carpet cleaner. You may read more reviews found on this site about Bissell steam cleaners in general. Also misleadingly called a steamer, this deep carpet and rug cleaner is no steamer but uses hot tap water to clean your rugs. It carries two tanks containing clean and dirty water. This steamer also uses detergent to clean your carpet or area rug. This is to the disadvantage of individuals who do not like using chemicals in their home cleaning. Apart from your rugs and carpet this deep cleaner will also does your upholstery and bare floors giving your investment more use than just rug deep cleaning. This is a very popular steamvac cleaner. 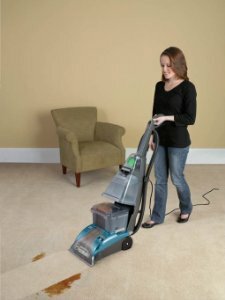 It is vacuums your rug first to pick up any loose particles and debris before deep cleaning with hot tap water. It is also preferred because it has no belts in its steamer accessories and parts. We fully recommend this Hoover steamvac. It has thousands of positive ratings averaging 4 out of 5 star reviews. It is however, on the pricey side selling for just $140.00. 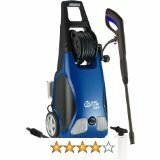 You may also read other general Hoover steam cleaner reviews by following the link.